In this graphic novel adaptation of the Edgar-nominated novel Head Games, Craig McDonald blends history and legend to tell the tale of the classic hard-drinking, hard-living, and hard-boiled protagonist. Artist Kevin Singles brings this noir thriller to life with a style reminiscent of the golden age of dime-store paperbacks. It’s 1957, and aging novelist Hector Lassiter thought that his adventures were long behind him. But then he receives a treasure worth killing for: the skull of Mexican revolutionary Pancho Villa. With his partners in crime, brooding poet Bud Fiske and hard-as-nails beauty Alicia Vicente, Hector must make a mad dash across the American southwest. If the trio can survive long enough to sell the skull to the highest bidder, they'll score big. But in the meantime, Hector must dodge bullets from deranged fraternity members, aging soldiers of fortune, vicious warlords, and crooked feds. Craig McDonald is an award-winning journalist, editor and fiction writer. In 2008, His debut novel, Head Games, was nominated for the Edgar, Anthony, Gumshoe and Crimespree Magazine awards for best first novel. Kevin Singles is an illustrator and cartoonist from a town in Wisconsin that's seen better days and worse days. So has he. He currently lives in Austin, TX, but good luck finding him. 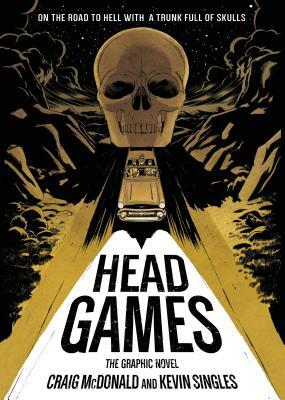 Head Games is his debut graphic novel. Les McClaine is the Eisner-nominated author of “Johnny Crossbones,” “Life With Leslie,” “Repeat Until Death,” and “Highway 13.” He has also illustrated numerous comics including “The Tick” and “The Middleman.” In 2008, “The Middleman” was made into a TV series for ABC Family.